We send 10 million+ tons of food waste to landfills every year, 10 million! It is estimated that by 2025 this will increase a further 1.1 million unless we each do our bit and try our best to nurture the planet we inhabit. 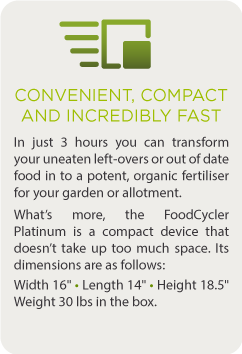 Using the FoodCycler Platinum, you can have your breakfast and by lunchtime be adding fertiliser to your beloved flower bed or allotment space, it really is that quick and easy to use. It’s a great feeling knowing you haven’t wasted money on food you haven’t eaten, that instead you have used that food to grow more food, or to nourish your hanging baskets; and of course, you’re doing your bit for the planet! 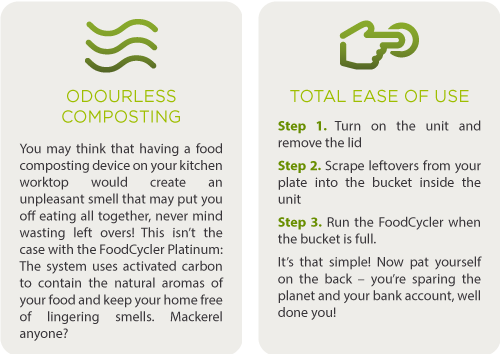 The FoodCycler Platinum is a fantastic tool for any keen gardener or for those who have their own allotment, either at home or on a rented piece of land. You can guarantee that the fruits and vegetables you are growing are being nourished by an organic fertiliser created at home, by you. 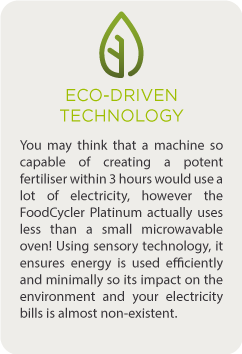 It’s a great way of reusing waste, saving the environment and keeping money you’d normally spend on fertiliser firmly in your pocket!